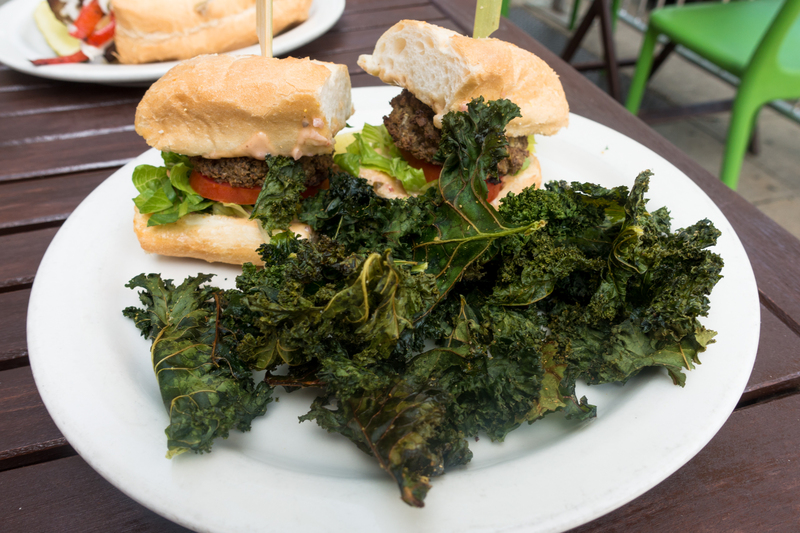 When you think of vegan-friendly cities, Madison might not be at the top of your list. 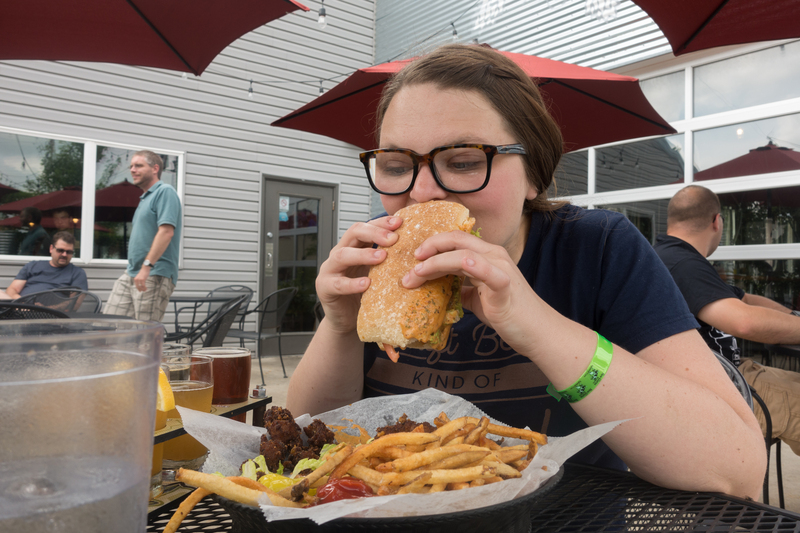 Vegan food in the heart of dairy country? 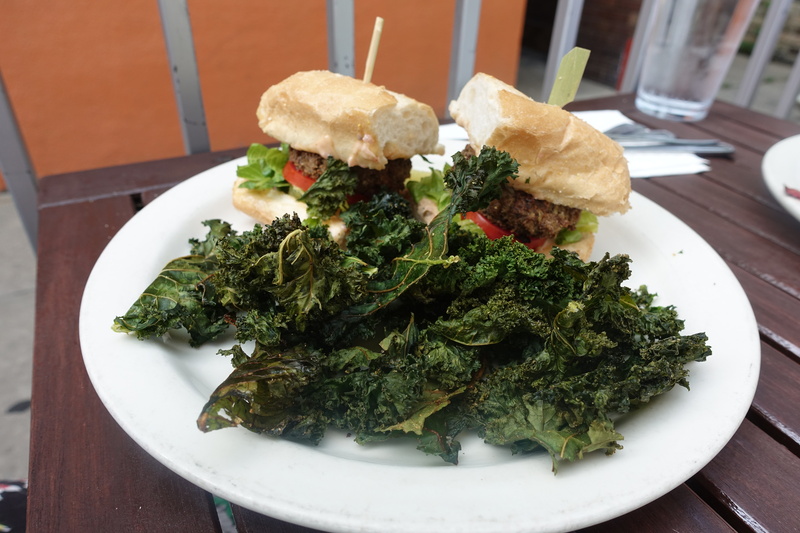 I think that you might be pleasantly surprised by all the vegan-friendly places in Madison —I know that was very surprised on my visit there last month. 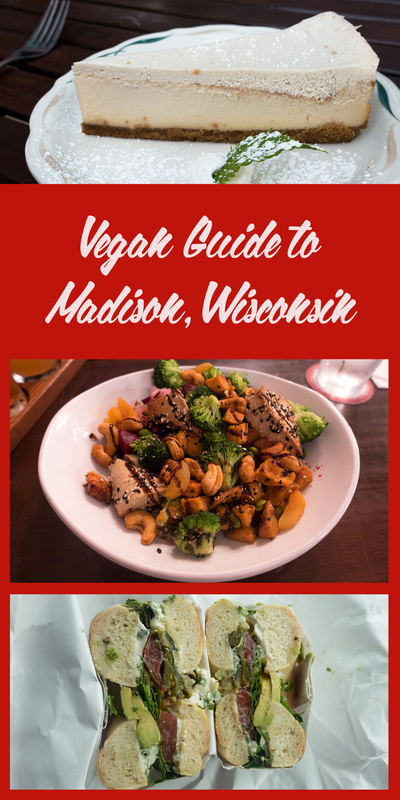 My vegan guide to Madison, Wisconsin will cover all the places that I went to on my trip. I wasn’t able to check out all the vegan-friendly places in Madison. It’s always great when there are more than two places that have vegan options! After a long day of travel, I was starving. After checking into the hotel, Phoebe and I headed to The Green Owl Cafe for dinner. 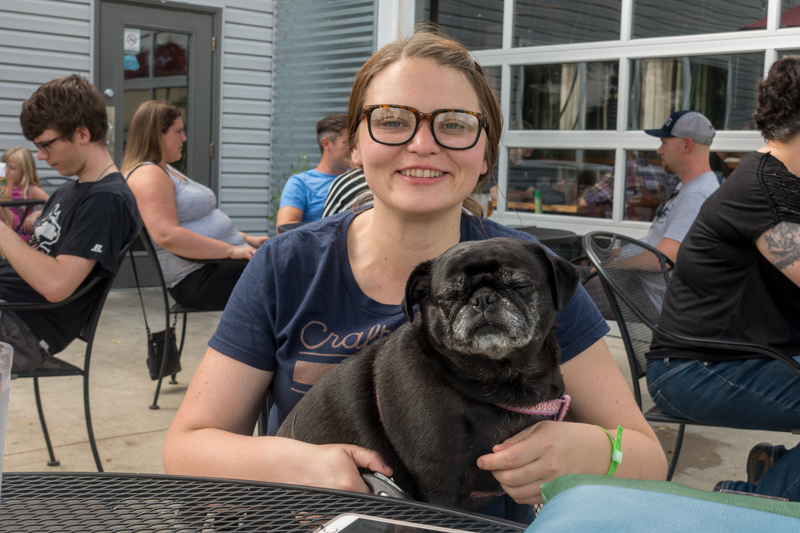 Their patio is dog-friendly, so I was able to bring Phoebe along with me. 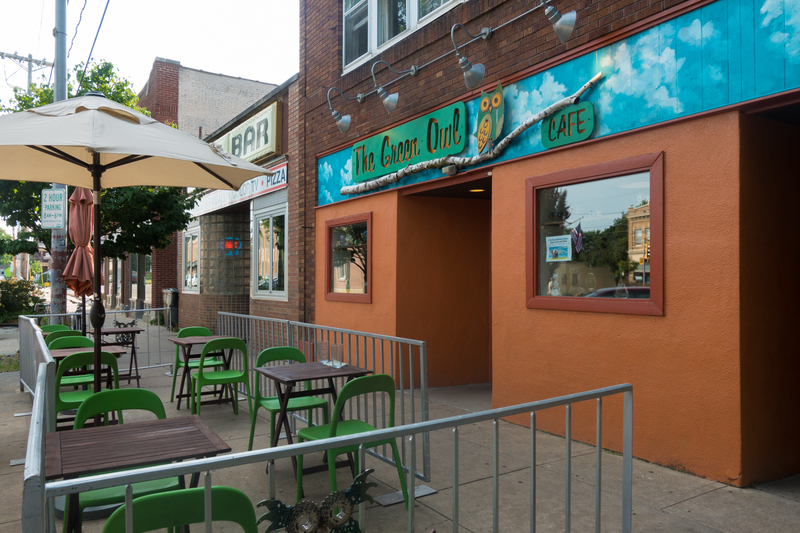 The Green Owl Cafe is Madison’s only vegetarian and vegan restaurant. Here you’ll find that both vegan and meat-eaters will be satisfied. 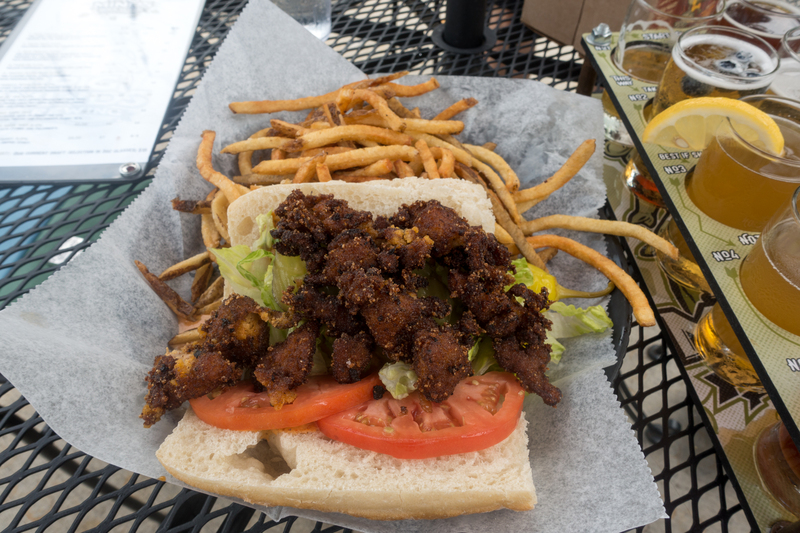 It was a hard choice deciding what to order, but the Crabby Cake Po’boy stood out. Vegan crab cakes served on a toasted roll with a chipotle remoulade. For my side, I went with the kale crisps. Such a delicious meal. The crab cakes were so and flavorful. I couldn’t resist ordering dessert. I went with the vegan vanilla cheesecake and it was out of this world. 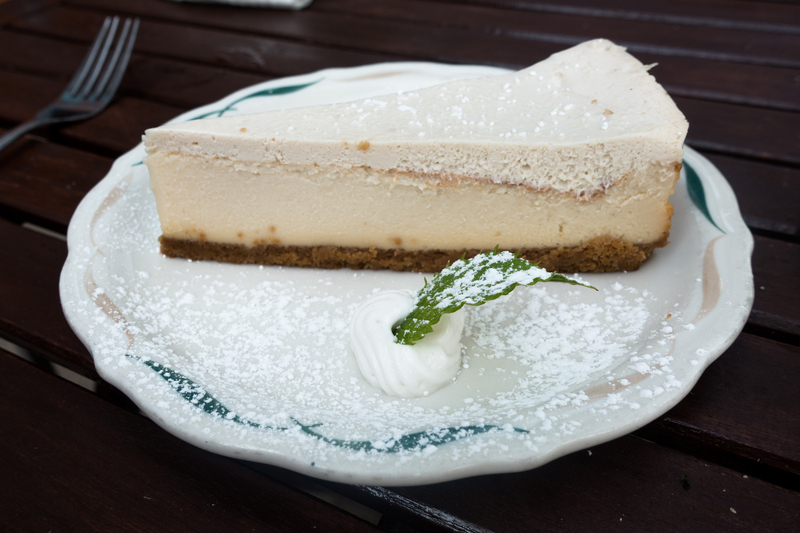 It reminded me so much of the dairy filled cheesecake that I use to love growing up. I highly recommend saving room for dessert! 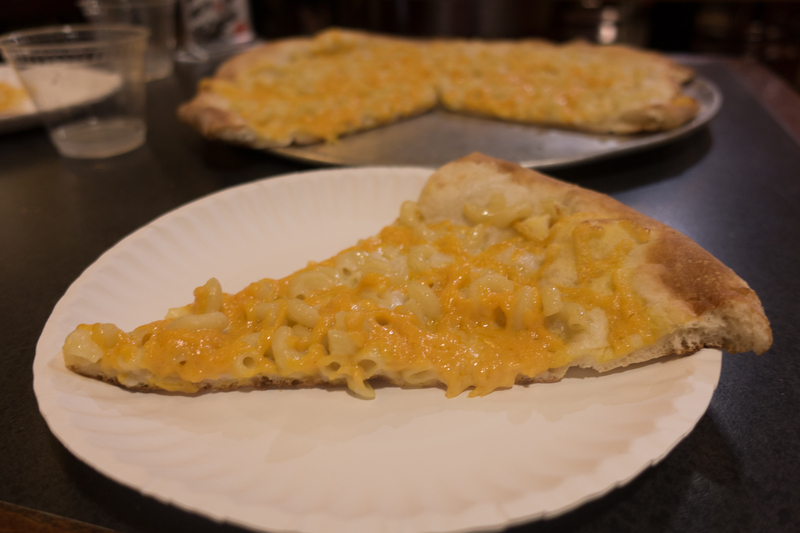 If you read my Travel Guide to Wrigleyville in Chicago post, you saw that I stopped at Dimo’s Pizza for a slice of their mac n’ cheese pizza. 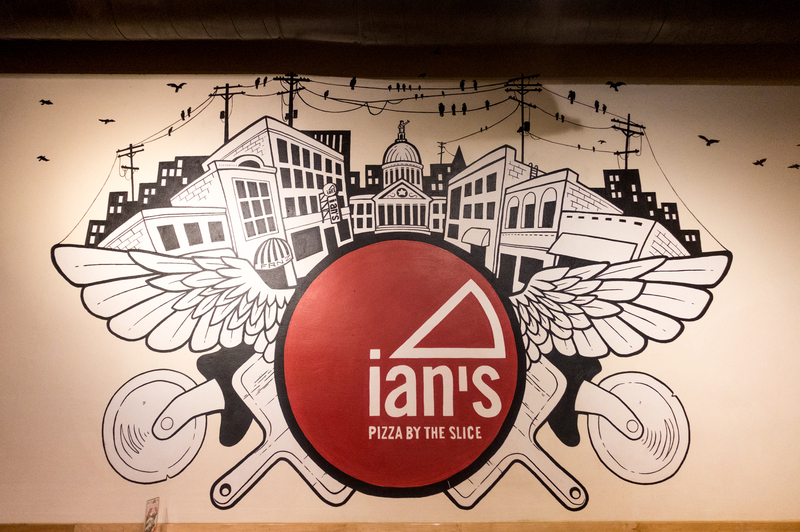 Dimo’s use to be Ian’s Pizza, just like the Ian’s Pizza in Madison! Of course I had to stop there and order a vegan pizza.I ordered the vegan mac n’ cheese pizza because who can resist cheesy pasta on pizza. Luckily, I had a fridge in my hotel room at HotelRED. There was just too much pizza! I think that pizza makes the best leftovers. 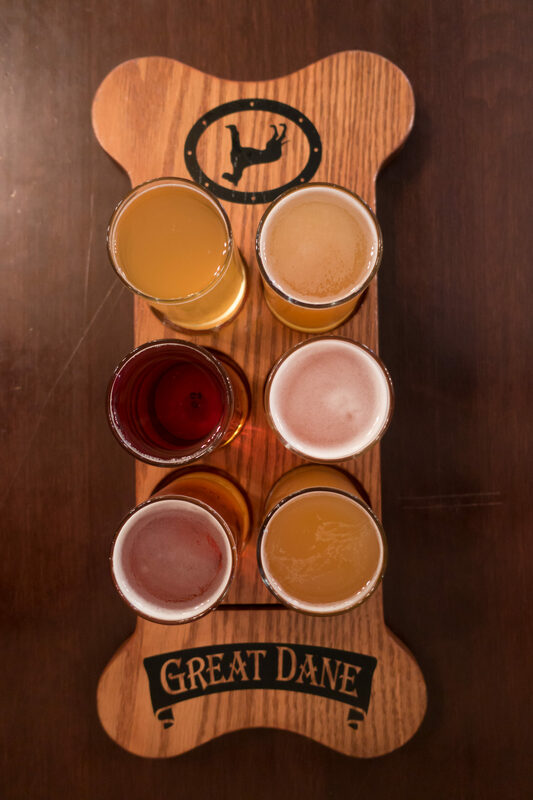 Great Dane Pub has multiple locations around the city. 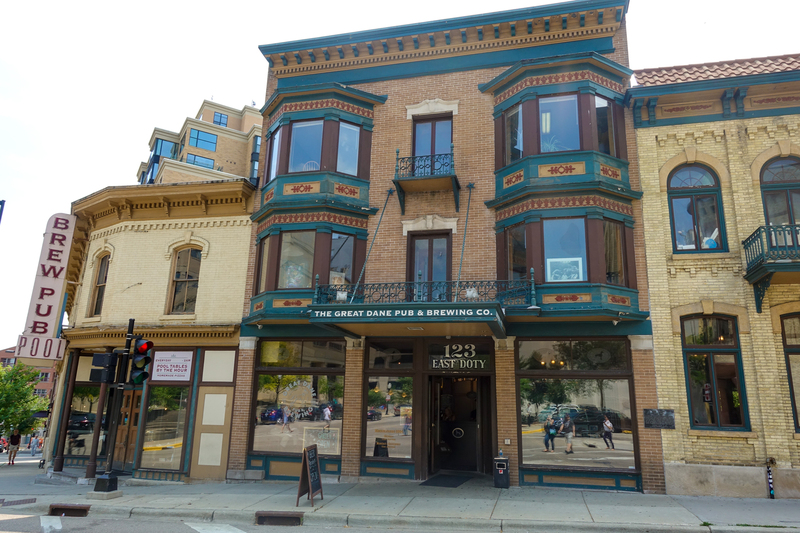 After doing a little research, I read many recommendations for visiting their downtown location. After visiting the pub located in 40 year-old “Fess Hotel” building, I can see why. The building was so neat to explore. It also happens to be on the National Registry of Historic Places. Of course, I had to try some of their craft beers. I ordered a flight and selected the beers from their current taps list. I must say that I was a fan of all the beer—something that doesn’t happen all that time. For lunch I ordered the High Point Harvest Bowl. The bowl had the perfect balance of flavors. The base of the bowl was a combination of brown rice and red quinoa. 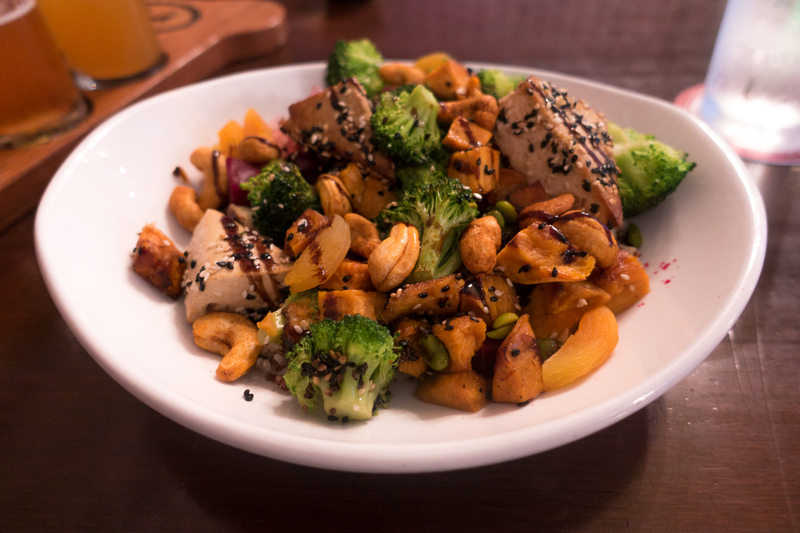 The grains were topped with veggies, dried apricots, sesame tofu and dressed with an orange ginger dressing. I loved everything about this bowl! 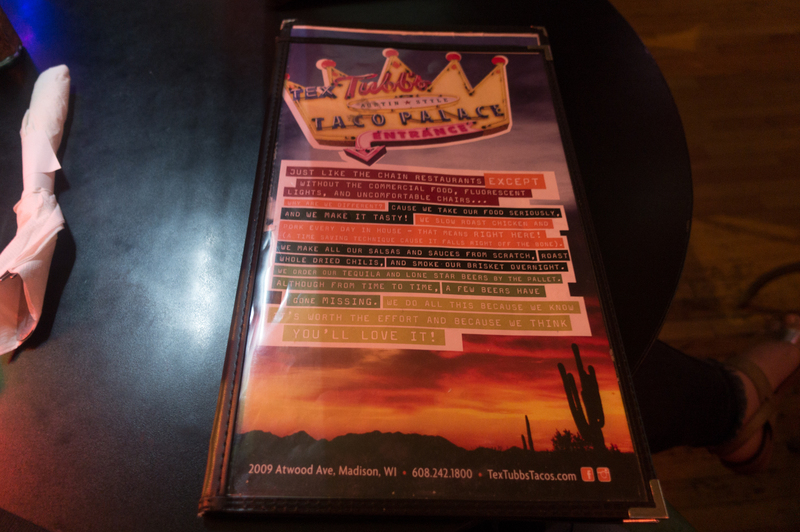 After checking out one of the local breweries, I headed to Tex Tubb’s Taco Palace for some vegan nachos! If you follow me on Instagram, you might have noticed that I have this thing for vegan nachos. 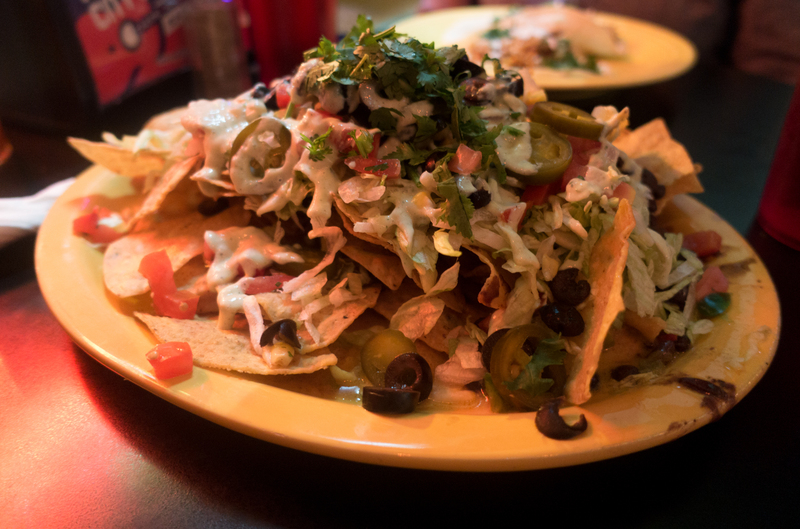 Nachos are definitely one of my guilty pleasures. There are quite a few vegan options on the menu, but I still had to satisfy my nacho craving. Perfect way to end the night! Before leaving Madison, I stopped at Gotham Bagels for breakfast. It had been along time since I had a bagel with cream cheese. 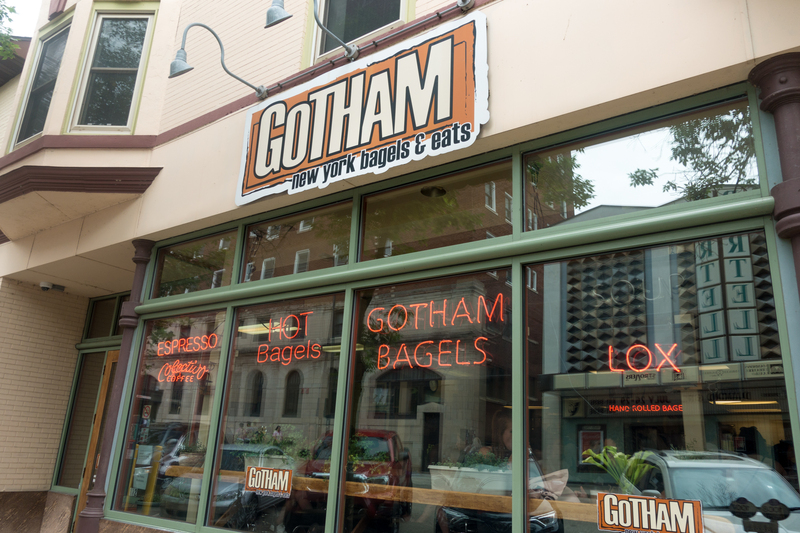 At Gotham Bagels, you’ll find NYC style hand rolled bagels. Just the way a bagel should be made. There are a few vegan cream cheese options at Gotham Bagels. 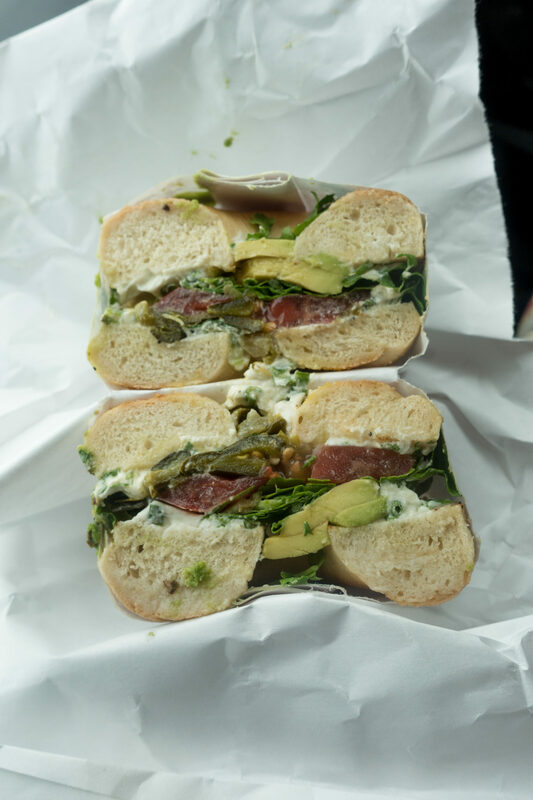 I ordered the Original V bagel which had a scallion tofu spread, poblano peppers, tomato, arugula, and avocado. I got the bagel to-go since there wasn’t any outdoor space to sit with Phoebe. It was messy, but delicious! On the way home from Madison, I just had to stop at Pig Minds Brewing in Machesney Park, IL. 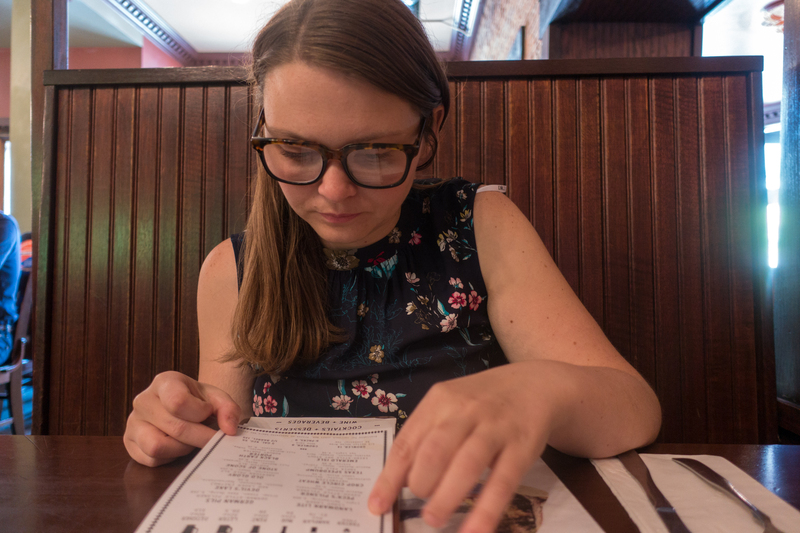 I have a vegan restaurant bucket list that just keeps growing. 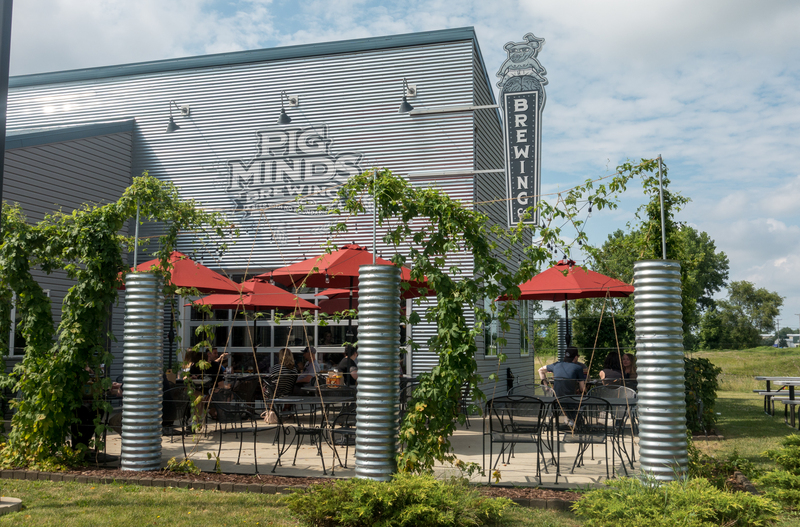 One restaurant that has been on my list for awhile is Pig Minds Brewing— a 100% vegan restaurant and brewery! When I realized that the restaurant was on my way home from Madison, I just had to stop. 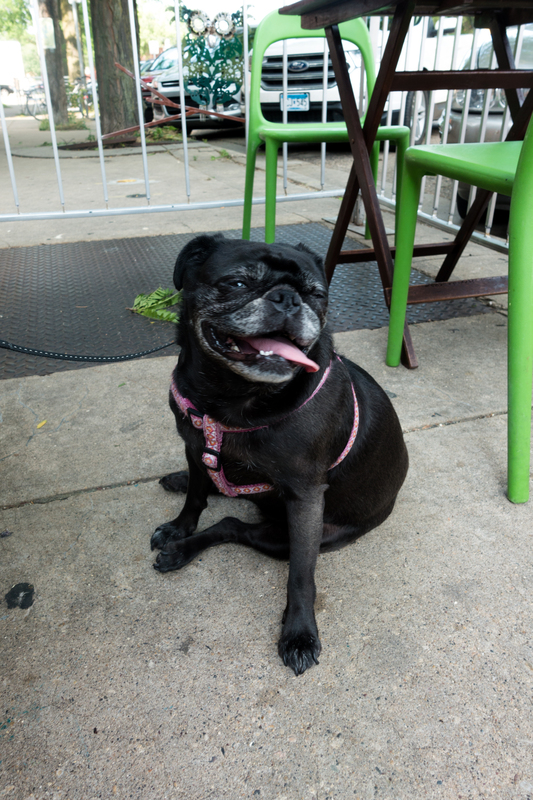 Their outdoor patio is dog-friendly, so I was able to bring Phoebe with me! I ordered their beer flight, which included a sample of all of their beers. It was probably the biggest beer flight that I have every had before. Don’t worry, I didn’t finish all of the samples. 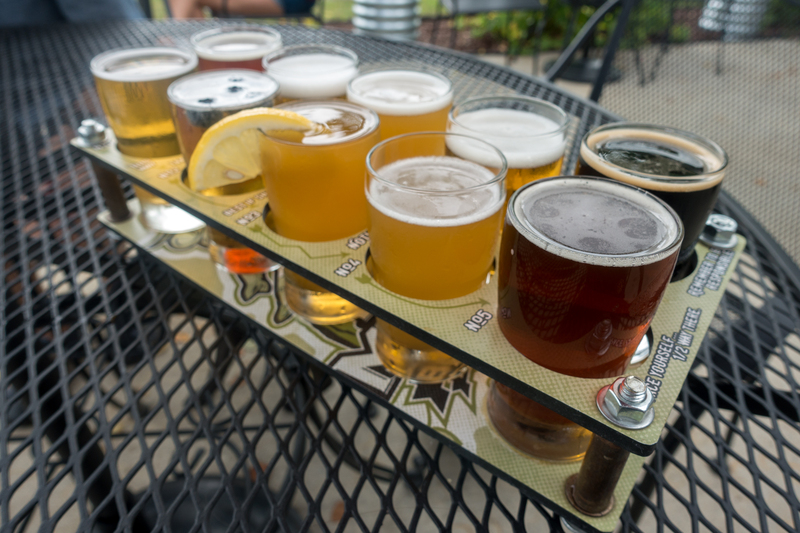 It is just nice to be able to taste all of the different beers. For my meal, I ordered the Oyster Mushroom Po’Boy Sandwich with fries. This is amazing It was also so spicy! I was so happy that I was finally to eat here. Highly recommend taking a detour here if you are traveling through Illinois and Wisconsin. I feel in love with Madison. I could definitely see myself living there one day. I loved the vibe of the college town and the plethora of vegan options available. Too see more of my trip to Madison, watch my travel vlog below! Hard to find places with Vegan options in my hometown, Lebanon, Pennsylvania…I would like to receive some simple and easy vegan recipes. Great article about Wisconsin and Illinois….THANK YOU! What a fun getaway! It’s been way too long since I’ve been to Madison. I adore Pig Minds Brewery. I would be there all the time if I lived in Machesney. 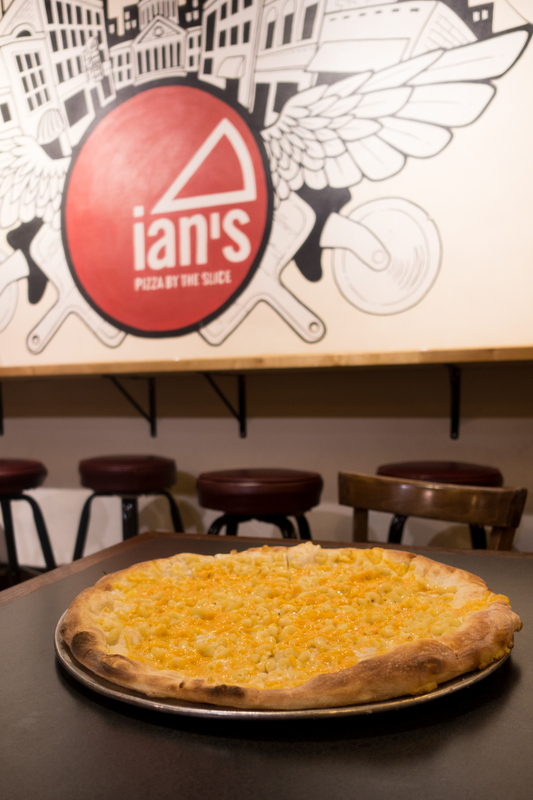 Also, I’ve never had mac and cheese on a pizza. I feel like I need to make up for this gap ASAP.